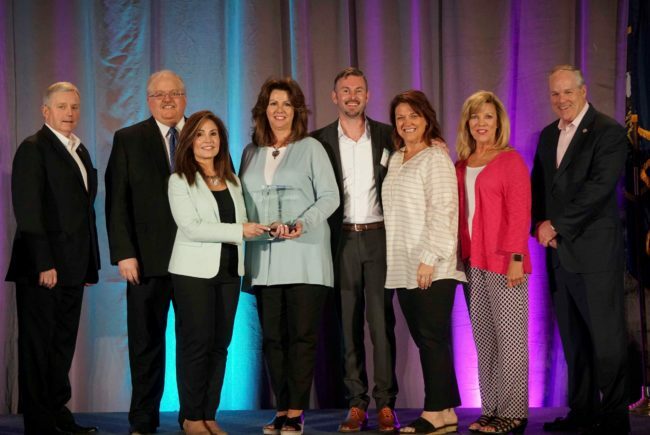 Blue Ridge Energy received the 2018 Edgar F. Chesnutt Award for Best Total Communication Program at last week’s CONNECT Conference in Salt Lake City – the highest honor given through the National Rural Electric Cooperative Association’s (NRECA) Spotlight on Excellence Awards program. The co-op was recognized for its communications campaign promoting a new community solar program in response to consumer requests for additional renewable energy options. Through effective promotion of the program using a wide range of channels, every panel in the solar array was sold in just 10 months. The co-op segmented their communications outreach into four distinct phases, a key step in successfully promoting their new community solar program. Communications methods included traditional and digital channels to reach every relevant demographic. Pictured left to right: NRECA President Phil Carson, Blue Ridge COO John Coffey, PR Director Renee Whitener, Communications Manager Susan Simmons, Energy Solutions Marketing Manager Jon Jacob, Support Specialist Luanne “Cookie” Bradshaw, Member Services Director Sandra Hicks and NRECA Senior VP Communications Scott Peterson.